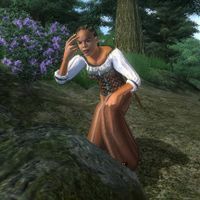 Dhola, a Redguard commoner, is a devout worshipper of the Daedric prince Nocturnal. She can be found with fellow worshippers Francine Velain and Mor gra-Gamorn at Nocturnal's Shrine in Blackwood. She won't leave the shrine for any reason, dedicating day and night to worshipping her prince. She divides her time between kneeling in front of the three lit candles, preaching from behind the lectern or simply sitting on one of the benches. At times she will also put down an unknown offering near the bridge leading to the Shrine. She wears a simple set of common, middle-class attire: a quilted doublet, tan linens and a pair of doeskin shoes. She wields an iron dagger and carries a medium amount of gold. When you first approach her, she will explain the desire to follow Nocturnal's sphere of night and darkness: "We seek what the darkness hides, and the Night Mistress is our guide." This page was last modified on 20 October 2015, at 05:24.